Custom Deco is a leading decorator of glassware and ceramic products sold throughout the United States. Custom Deco markets its products to promotional products distributors, food service dealers, and premium & specialty retailers. The Company also operates as a contract decorator for ceramic and glass manufacturers. 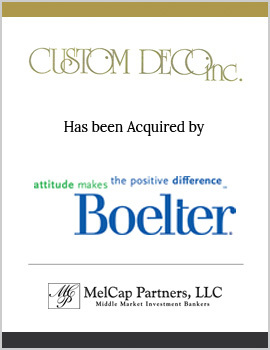 MelCap Partners acted as sell-side advisors to Custom Deco, Inc. Custom Deco was sold to The Boelter Companies, Inc. Boelter is a leading distributor of equipment and supplies to the commercial and institutional food service and beverage industries and commercial sanitary maintenance market.